Oh my gosh—it’s not possible the leaves are starting to turn to brilliant colors here in Illinois! Where did summer go? Hope yours was filled with lots of fun and memories! I was busier than ever trying to get Wicked Moon to the publisher, golf matches, and time with family and friends. Things are on track for my mid October release of Wicked Moon in Cape Cod. I’ll be giving you an update on what’s happening there and how you’ll be able to get your copy of Wicked Moon, both in print and e-book format. Enjoy the book trailer for Wicked Moon on this blog. 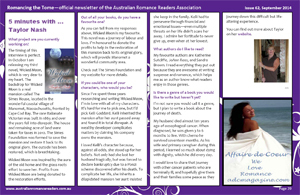 I’m thrilled to share an interview I did with the Australian Romance Readers Association recently. Stay tuned for the release of Wicked Moon coming to you soon! !